GRAMMY award winning artist Fuse ODG announces his new album New Africa Nation today, along with the release of new single 'Bra Fie (Come Home) ft Damian 'Jr Gong' Marley'. 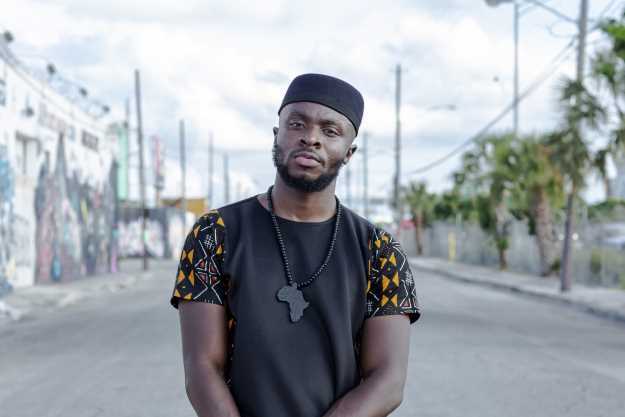 Fuse ODG is the GRAMMY award winning artist who brought the Afrobeat sound to the mainstream and has worked with the likes of Ed Sheeran, Major Lazer, Sean Paul, Tiwa Savage and many others. His new album New Africa Nation is announced today along with the release of new single 'Bra Fie (Come Home) ft Damian "Jr Gong" Marley'. Here at Indie Mixtape we were lucky enough to have a chat with the charismatic and charming man himself. Indie Mixtape: Thank you so much for taking time out of your day to chat to Indie Mixtape. You've had such a busy time lately, launching your clothing range last year,working on your charitable foundations, recording with lots of different artists, including your track with Sigala and releasing your hit 'Island' this summer. I'm amazed you've had time to record your album! How long have you been recording it for and what's been the process? Fuse ODG: It's hard to say how long the album has taken to get recorded because I make music every day! It's taken me a while and it's been a journey. It doesn't just take sessions to record it, it's about living a story and understanding the motive behind it. In a week I can record up to 15 songs and that's almost an album, but it's about choosing the right songs to tell the right story. I've grown from recording this album, I feel mature as a person. I've learnt so much about my own history, so I hope that this album allows people to learn about their roots, especially people of African descent. I hope I can showcase my culture to the world and make them want to come to Africa and see what I'm talking about. IM: The new album is called New Africa Nation, can you tell me a bit more about what that means to you and how does this progress from your TINA work and message? F: The previous album TINA (This is New Africa) was about changing the perception of Africa and changing the mentality of Africans and how people see Africa. It was more like a mentality, whereas this album is more for lifestyle. Now we have proud Africans and people who have love for Africa and the perception is gradually changing. Everything right now is becoming tangible. Rather than talking about mentality, this album is more about lifestyle and the reality of the new Africa. It is really encouraging people to continue to love ourselves, and use this pride we have to build a nation. IM: The album has a lot of features on it such as Damian Marley, Ed Sheeran and Stefflon Don, how did the collaborations come about? F: All the collaborations on the album are from people that I've crossed paths with on the mission. They are people who are interested in the work that I'm doing for the motherland and the work that I'm doing in Ghana. Every time I meetup with Ed Sheeran we talk about the perception of Africa, how we're trying to change it and the school that we are investing in and building in Ghana. For this record, it just happened that he really wanted to come to Ghana at the time. It was supposed to be a chill vibe but the way we are as musicians naturally we started making music every day. He came on the basis of wanting to come and see Ghana. So we'd go out in the day and explore the country and then we would come back and just talk about how our day went, through the music. So everything was real, it was us exploring the motherland. Working with Damian Marley came from conversations that we were having about him representing the Caribbean and carrying on his dad's legacy and me repping Africa. We discussed his dad and people like Marcus Garvey and Kwame Nkrumah, these are people we look up to and are historical leaders. They always promoted black people moving together, not just "you do your thing over there", and "you do your thing over here", it's about us doing our thing together. Damian and I made Bra Fie which means 'Come Home'. The song is an encapsulation and a metaphor for people to come home, not just physically but also to love yourself and be you, be who you are. What are you doing to love yourself and better yourself? Come down to the motherland, come to Ghana and lets help build the continent. With Stefflon Don, she wanted to visit the school and asked if she could help out. We went to the school and she brought loads of toys for the kids. They were so excited to see her and it was so lovely to see her visit Africa for the first time. While she was there we caught a vibe and ended up in the studio making music whilst doing something for the mission as well. There's one more collaboration that I have included in the album, it's with the Ghanaian artist Sarkodie. He's the biggest rapper in Ghana and one of the biggest in Africa. I wanted to involve the local talent as well and he's a hero in Africa! IM: The single Bra Fie is released today, with an amazing video to accompany it, can you tell me about the single and how the video amplifies the meaning behind it? F: The video is very educational; it lets you know what happened in the past and what is happening now. The fact is that there are many comparisons and similarities between these two times. We need to find a way of learning how our ancestors dealt with it in the past and see if we can find a way of dealing with it now. The video goes deep in to our history, Marcus Garvey said "A people without the knowledge of their past history, origin and culture is like a tree without roots". Unless you know your history you don't know where you're going, so I felt like highlighting our history in order to understand and find a way forward. The video gives an insight to our past, our present and the future solution which is 'Bra Fie (Come Home)', let's love ourselves, let's come home. IM: Musically there are lots of different styles on the album, other than the people that you've been working with, what have been your influences? F: It's living the journey and what I've seen travelling. I get to meet so many different people and experience different vibes. The track 'Island' is from my trips to LA, Miami and Puerto Rico. I love the good Latin vibes they have. Visiting America, I've met people who look like me, but don't know where they're from. They call themselves African Americans but they don't really know where they're from. Also an influence has been what is happening in the UK with knife and gun crime. It inspired me to want to make songs that empowered our young people and make them understand that they are Kings and Queens. We should be loving each other, should be protecting a brother, you should be protecting the person next to you, we're all the same people. If you look at life from a perspective of self-love, you won't want to hurt the person next to you and we'd all be better people. Of course you also get the good vibes, the album will make you dance, it will make you think, it will make you love yourself, it will make you crazy, go wild, it will make you turn up! Of course the turn up is there as well because I've done so many shows where we party and meet people from different backgrounds. We party all together and the reason why we're able to this is because good vibes have no colour to them. Happiness is just happiness. I can't wait for you guys to hear the album, we're now moving from a mentality to a lifestyle.